Couple of weeks ago decided that Finland has reached a true milestone on its road from finlandisation to globalisation. Being from the Netherlands I occasionally like to make simple Dutch-Indian dishes such as Nasi Goreng and Sate (spicy peanut) sauce. In the first 12 or so years in Finland this meant bringing the all-important jars with sambal oelek from the Netherlands. Since around 2000 some better supermarkets offered imported sambal. 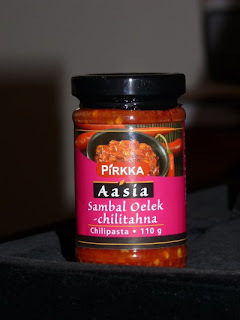 But now there is "Pirkka" sambal, where Pirkka is the house brand of the major Finnish supermarket conglomerate Kesko; and the unofficial certificate for something being mainstream Finnish.